It's been a long time since I've posted a book review but that doesn't mean I haven't been reading. I'm always reading, duh. If you look in my purse at any given time you'll find at least one, maybe two books. On a similar note, I just bought my first e-reader. I have an ipad mini that I've used for a few years for books that I don't plan on sharing with Charley or loaning out to other folks and I've loved how compact and lightweight it is-makes it great for travel obviously. Probably my favorite thing about it is the function that allows you to have a black background and white lettering-way easier on your eyes and helpful when you're trying to keep the light dim in bed if someone else is sleeping. The mini has been great but my big beef with it is that the battery dies pretty quickly. 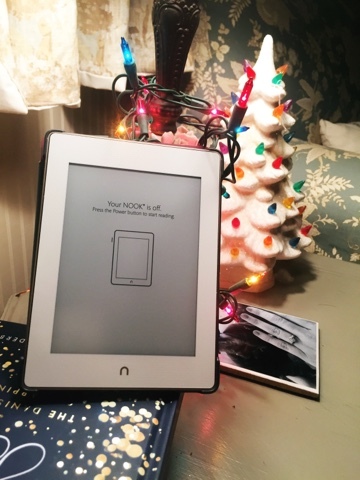 When I found out that the new Nook Glowlight Plus had a 6 WEEK battery life and was WATERPROOF I was sold. It's super tiny and lightweight. So far my only complaints are that the classics, like A Christmas Carol, aren't free like they are on iBooks. Bummer. Also, it seems like you can't make the font smaller either-does anybody know about this? Can I make the Nook font smaller? HALP! Anywho, we'll see how long the battery lasts, I'm pumped to not have to add more clutter and books to my life unnecessarily. Hopefully I don't become one of those people who has an e-reader and still ends up buying books-I'm definitely going to try not to. Planning on only buying physical books if it's something I'm going to be sharing with Charley (he hates e-readers) or if I buy it secondhand. Anywho, I wanted to wait until I'd finished two of the books I'd gotten from Patagonia (yes I still buy books from them) so I could post the reviews together. 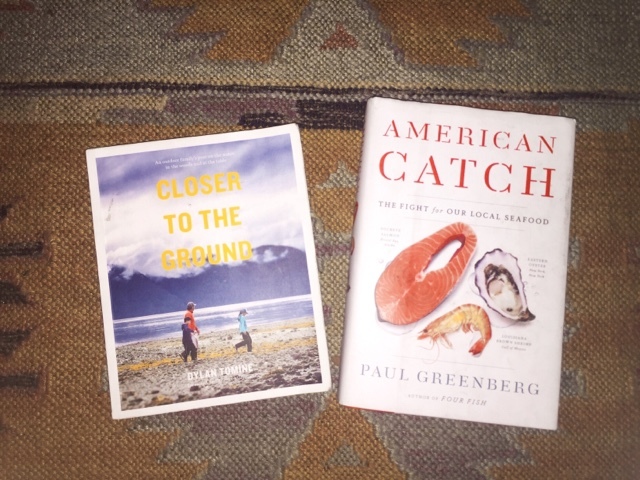 The two books I read this fall were Closer to the Ground by Dylan Tomine and American Catch: The Fight for Our Local Seafood by Paul Greenberg. I had studied global fisheries in undergrad but naturally when we started fly fishing we got more interested in everything having to do with water. The first book, Closer to the Ground is narrated by author, Dylan Tomine as he talks about teaching his kids the importance of growing or catching their own food and making sustainable choices like using felled wood for heating that family's house. A lot of it is based around fishing and digging for clams but it never gets boring. It's very personal, like an old friend telling you a story. As much as food studies books can come off as super granola, his writing is far from that-he admits that his system is not perfect but the effort is there. I think one of things I liked most was his candor. He emphasizes how much work it takes to do things the more sustainable way but bottomline is, he's walking the walk for his kids to see and I respect that. The other book I just wrapped up, American Catch is like most food studies writing in the sense that it's broken into sections based on food. I definitely got some Michael Pollan vibes when I first cracked it. The book reviews how our seafood system is screwed up-outlining specifically three different species: oysters, shrimp, and salmon. It was a bit dry at first but picked up somewhere in the shrimp section for me. As much as I've read over the years, I didn't know exactly how much of our American caught seafood is sent abroad to Asia while alternatively, we import farm-raised garbage from there. I could go on for days about all the facts and what's right but my recommendation is to just read the book. Overall not super thrilling but definitely educational. Fun fact about myself: I LOVE Christmas books, like the somewhat romance novely kind. I am about to finish up one called Christmas Joy and I have to say, probably new favorite Christmas book-I don't want it to end! 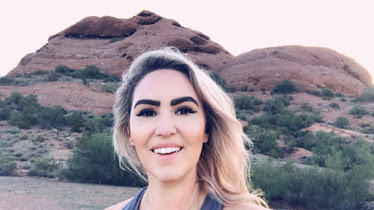 I won't be posting a review of that one because you can't review absolute holiday happiness but I will be posting one for a book I finished a few weeks ago titled, Hygge, that discusses the Danish concept. 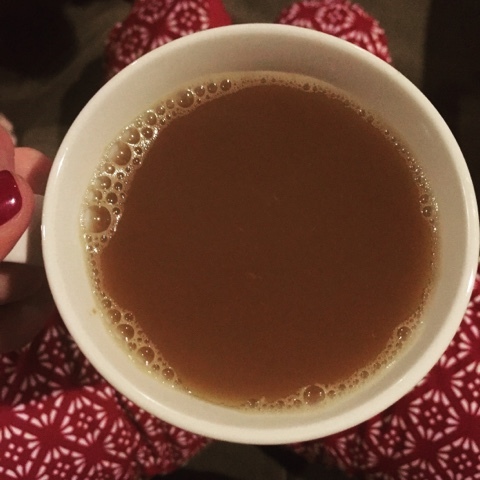 If you don't know what hygge is, google it and then come back for the book review! What are you reading? Have you tried sitting by the crackling fire, listening to carols and reading?! If not, see my previous post with all the links to FREE carols and fireside sounds!